With the NHL’s Feb. 25th trade deadline just two weeks away, general managers are evaluating their rosters to determine which players to move and which ones to pursue. A number of clubs have already been active in the trade market this season. Some might not be done dealing. Here’s a look at those that could still make another move or two before the deadline. In need of scoring punch, Hurricanes general manager Don Waddell sent struggling center Victor Rask to the Minnesota Wild for winger Nino Niederreiter. The deal paid off handsomely thus far, with Niederreiter tallying six goals and nine points in 10 games since coming to Carolina. With the Hurricanes surging into playoff contention in the Eastern Conference, Waddell could be tempted to swing another deal soon. For months, there’s been media speculation suggesting he could swap one of his right-shot defenseman for a scorer. Winger Micheal Ferland is a pending free agent who has surfaced as a trade candidate, though Waddell could opt to retain him for the postseason push. With his club’s playoff hopes fading, Panthers GM Dale Tallon already made a couple of forays into the trade market. He sent goaltender Michael Hutchinson to Toronto for a draft pick, defenseman Alex Petrovic to Edmonton for Chris Wideman and a pick, and recently shipped forwards Nick Bjugstad and Jared McCann to Pittsburgh for Derick Brassard, Riley Sheahan, and two draft picks. It’s believed Tallon might pursue Columbus Blue Jackets goaltender Sergei Bobrovsky and winger Artemi Panarin this summer via free agency. Of late, however, there’s media chatter indicating the Panthers GM looked into acquiring one or both before the trade deadline. The asking price for either guy will be expensive but Tallon has a history of making bold moves. Kings GM Rob Blake already made two significant trades this season. In November, he shipped winger Tanner Pearson to Pittsburgh for winger Carl Hagelin and last month peddled defenseman Jake Muzzin to Toronto for a first-round pick and two prospects. On Thursday, Curtis Zupke of the Los Angeles Times reported Blake was looking for deals comparable to the Muzzin trade, swapping veterans for picks and prospects. Sportsnet’s Nick Kypreos reported Sunday winger Ilya Kovalchuk might be willing to waive his no-movement clause to join a contender. First-year GM Paul Fenton‘s made one notable move thus far this season, sending Nino Niederreiter to Carolina for center Victor Rask. With his club struggling to hang onto a Western Conference wild-card spot, losing center Mikko Koivu to a season-ending injury could send Fenton back into the market. If the Wild tumble out of a playoff berth, Fenton might become a seller by dangling pending free agent center Eric Staal or perhaps shopping forward Charlie Coyle. On the other hand, he could be tempted to make a move to improve his club’s hold on a postseason spot. Considered a serious Stanley Cup contender, the Predators are believed “all in” to win this season. Earlier this month, GM David Poile sent a 2019 second-round pick to New Jersey for center Brian Boyle and reacquired winger Cody McLeod from the New York Rangers for a draft pick. 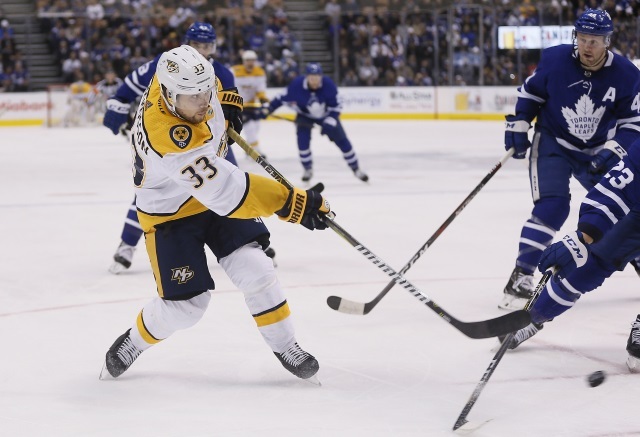 Having brought more grit to his lineup, Poile could set his sights on adding a scorer. Following the Boyle and McLeod deals, The Tennessean‘s Joe Rexrode speculated Poile might look at Columbus’ Artemi Panarin, Ottawa’s Mark Stone, or Philadelphia’s Wayne Simmonds. Penguins GM Jim Rutherford‘s been among the busiest in this season’s trade market. In addition to swapping Carl Hagelin for Tanner Pearson, he sent Daniel Sprong to Anaheim for Marcus Pettersson followed by Derek Grant to the Ducks for Joseph Blandisi, traded Jamie Oleksiak back to Dallas for a draft pick, and shipped Derick Brassard, Riley Sheahan and two draft picks to the Panthers for Nick Bjugstad and Jared McCann. With the Penguins winning just three of their last 10 games, however, Rutherford could continue tinkering with his lineup. Much will depend upon their performance over the next couple of weeks. Earlier this season, Leafs GM Kyle Dubas made a handful of minor moves. But on Jan. 28, he made a big splash by acquiring Jake Muzzin from the Kings. Having bolstered his blueline, Dubas could be looking for a physical scoring forward. Some pundits suggest pursuing Philadelphia Flyers winger Wayne Simmonds. On Thursday, TSN’s Pierre LeBrun noted the Leafs scouted a recent Carolina Hurricanes game and wondered if winger Micheal Ferland was on their radar.